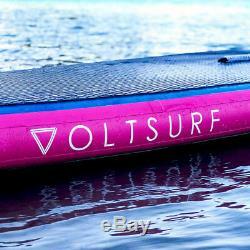 VoltSurf 11 Foot Rover Inflatable SUP Stand Up Paddle Board Kit w/ Pump, Pink. Surf, drift, cruise, or glide on the water of your favorite lake, stream, or river with this 11-foot-long inflatable paddle board. Sturdy, high tensile, drop-stitch fibers can support between 75 and 325 pounds of person and gear. You and your gear remain secure on the paddle board thanks to its diamond back traction pad for your feet and bungee lasso for cargo. Uses a single fin setup found on traditional rigid SUP and surfboards for easy repair, interchanging, and replacement. 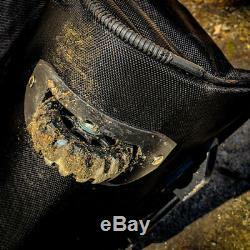 Includes 3-piece paddle that can adjust in size to accommodate different riders, dual action pump for inflation, and over-sized wheeled carry bag. Whether you like to surf down coastlines, glide on lakes, or cruise up and down rivers, the VoltSurf 11-Foot Rover Inflatable Paddle Board is here to facilitate your adventure. Its heavy-duty, high-tensile, drop-stitch fibers weave a sturdy paddle board with awesome designs that best suits riders and gear weighing between 75 and 325 pounds. The paddle board sports a rough diamond back traction pad that slicks water off the board and provides stable footing for you. Your small gear like drink bottles and small tackle boxes can ride easy as well with its secure bungee lasso. The paddle board kit comes with everything you need to inflate and go. It includes a 3-piece adjustable paddle, dual action pump, and over-sized wheeled transport bag that fits the deflated paddle board, pump, and paddle. 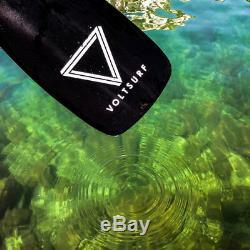 You can start your roving adventure downstream right away with the VoltSurf Rover Paddle Board. Inflated paddle board carries easily thanks to its heavy-duty Captain Handle. Floating paddle prevents accidental submersion. Single fin design provides excellent tracking without the drag causes by side fins. Manual pump pushes air as you push and pull and includes a gauge that lets you see when the board has reached 15 PSI. Dimensions (L x W x H): 11 feet x 32 inches x 6 inches. VOLTSURF is a factory direct board brand. With VOLTSURF we cut out all the middlemen and give you quality boards at factory direct pricing. It makes us feel good about what we do when we can share the excitement and savings. We also pride ourselves in making a board for every type of rider and condition to make sure you can get the perfect board for you. Our favorite part of our business is getting to know our customers. We encourage you to share with us your photos and stories. Part of how we keep costs down and pass the savings onto our customers is by marketing with customer generated content. We don&###xE2;&###x80;&###x99;t believe in hiring expensive models and producing exotic photoshoots. Send us your pics or join us for a paddle session and let&###xE2;&###x80;&###x99;s make & share our High Five Life. This listing is currently undergoing maintenance, we apologise for any inconvenience caused. 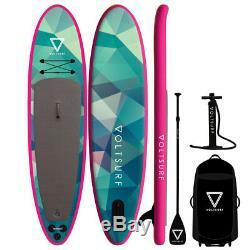 The item "VoltSurf 11 Foot Rover Inflatable SUP Stand Up Paddle Board Kit with Pump, Pink" is in sale since Thursday, January 17, 2019. This item is in the category "Sporting Goods\Water Sports\Stand Up Paddleboarding\Stand Up Paddleboards". The seller is "vminnovations" and is located in Lincoln, Nebraska.